When companies move into a new space in SoHo, they have to bring their A game. Nobody wants to be overshadowed by all those high-end fashion stores or minimalist art galleries that somehow stay in business despite never seeming to sell anything. 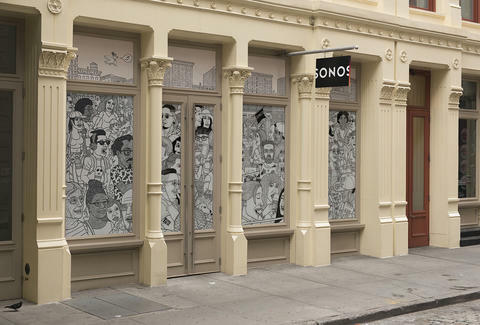 So when Sonos decided to put their new flagship store in SoHo, they had a pretty high bar to reach. Luckily, they pulled through in spectacular fashion, creating an entirely new kind of retail space that changes how we’ll think about stores. We took an exclusive tour of the new space and have the inside scoop on what makes the design so groundbreaking -- and why you’ll want to visit even if you’re not in the market for a new sound system (though that may change…). Sonos could’ve just followed the recent trend of airy spaces and open tables with the speakers sitting on shelves. And while they have adopted the modern, concrete-and-wood look of many stores, they’ve taken a huge risk with how customers interact with the speakers. Typical retail design rules are all about simplifying the buying process by putting few barriers between the buyers and the product. Sonos took the confident approach, believing that their products speak for themselves. With that in mind, they’ve set up an entirely different flow for the store; rather than a typical layout of products and their price tags, Sonos has set up six discrete “homes” -- stylized soundproof listening rooms with a full Sonos system. Each pod has a wall representing the kitchen (featuring a set of play:1 speakers), a living room (a full AV setup including their playbar and subwoofer), and a study (stereo play:5s that can blow your hat off, if you so choose.) In the spirit of Sonos’ acoustic obsessiveness, each piece of décor has been placed to complement the speakers and establish perfect room acoustics. The Sonos speaker aesthetic inspires the design of the space, with perforated walls imitating the look of a speaker grille. Even the speakers themselves have been turned into works of art, like the "tree" of Sonos that graces the entrance and the 300-speaker "Wall of Sound" at the back of the store. It’s worth noting that each of the “homes” has been accented with artwork that plays off of musical history and New York culture. In the study, you might find a book by David Byrne or a vintage camera. Included in the mix is one room with illustrations by Mark Alan Stamaty, who also drew the store’s facade depicting the energy of SoHo. Or perhaps you might be drawn to the wallpapers designed by Apartment Therapy’s Mark Chamberlain. He created six original paintings inspired by vintage 1940’s wallpaper to grace the walls of the Sonos "homes". Speaking of vintage, it’s important to head to the very back of the store, where a set of stairs will take you down to a tucked-away, seventh listening room hidden beneath the others. The room is a throwback to a different era of music listening, but it also serves as a temple to some of The Greats in design history. Sure, listening to vinyl played through quad play:5s is unbelievable, but the experience gets even better when you do so while relaxing in an Eames lounge chair. Be sure to admire their original Dieter Rams reel-to-reel tape player, which Sonos reportedly procured from a German audiophile who wouldn’t let the thing go unless it went to a loving home. 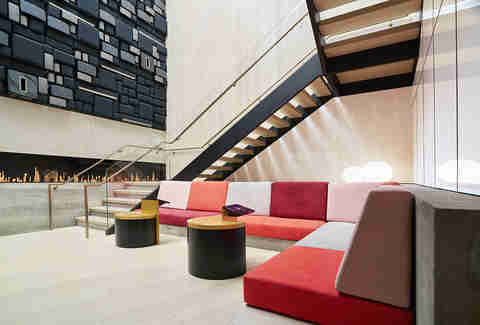 The Sonos flagship store is built with admiration for the musical history of New York. It’s clear to anyone who visits that the Sonos store is built with admiration for the musical history of New York. When you first enter the store, you might be surprised to see a giant mural of an old, bearded man meditating on a couch. While this might not scream “brilliant modern branding” to the casual observer, music nerds will quickly identify this guru as none other than Rap Jesus himself, Rick Rubin. Rubin -- the legendary producer and founder of Def Jam Records -- has been a long-time supporter of Sonos, and even provided feedback during the design of their speakers. Rubin’s “ommm” face is a hint at how the Sonos designers wanted the space to feel: peaceful, simple, with a nod towards the greats of music history. And it certainly didn’t stop there. An entire wall of the Sonos store is a shrine dedicated to indie music history with fanzines. Where would punk be without zines? These fan-made works of love cataloged and shaped the punk music revolution in the ‘70s and ‘80s, giving the genre a visual style to match its musical attitude. Fanzine collector Arthur Fournier has curated a collection of these for display at Sonos’ flagship. The wall is a time capsule from the glory days of the New York indie scene, with issues of Jazz sharing space with Ramones and Blondie interviews. The wall serves as a center point to the flagship's driving philosophy of celebrating the independent spirit and sound of New York music, while showcasing its systems as the next step in musical evolution.